Touch up your garden without the struggles of petrol with the RYOBI 18V ONE+ Line Trimmer Hedge Trimmer Kit. Each tool in the kit delivers enough power and performance for a job well done, but without any of the hassle. There’s no pull starts, no priming, no mixing of fuels and no waiting for the tools to warm up. Simply plug in either of the 2.0Ah Batteries included, and you’re away. Each tool has been engineered to deliver a quality result around the garden. The 450mm bar length and 10mm cut capacity are enough to tackle most edges and branches around your hedges. And when it comes time to tidy up the lawn, the rotating head of the Line Trimmer can make edging a breeze. 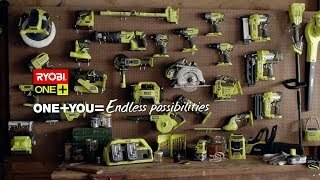 With 2 batteries and a 2.0Ah Charger ready to go, you’ll be ready to power any tool in the RYOBI ONE+ range. For the simplest solution to perfecting your garden, grab yourself a RYOBI 18V Line Trimmer Hedge Trimmer Kit from your local Bunnings Warehouse.